My article for Eight Magazine, loved this show! Synonymous with all things great about Britain, the Burberry Prorsum show always attracts the biggest celebs. The SS16 show was no different. From Kate Moss, to Benedict Cumberbatch, the stars filed into Hyde Park to see what Christopher Bailey had in store. As usual, Burberry was ahead of many other fashion houses and was the first to live snapchat the entire show! Totally ahead of the game, this meant everyone could enjoy something that is usually exclusive to fashion editors and VIPs. It also reaches out to a younger generation of fashionistas, the typical age of a snap chat user is under 25. With Alison Moyet serenading the show (along with a 32 piece orchestra of course!) the collection could have easily have been for autumn/winter, with emphasis on transitional pieces, including bold black coats and trenches. The traditional trench was given a lace infusion for SS16, which made for a stunning composition. Lace ran through the collection, with delicate dresses and camisoles paired with chunky wedges and caged heels. The juxtaposition between the delicate pieces mixed with hard lines and dark colours made for looks that felt modern, but with the Burberry twist. It’s all about mixing textures, colours and styles. We also saw the new ‘it’ bag, when it came to the accessories. Forgot the personalised capes, so last season! 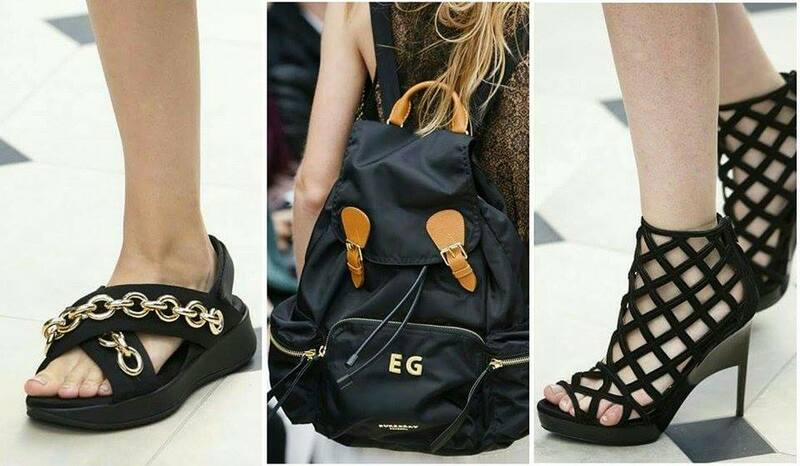 Spring/summer 2016 is all about the monogrammed back pack. Yes, that’s right backpack, they’re back big time, and personalised is the way to go. The rather masculine looking bags were thrown together with the fragile lace dresses and flat chain adorned chunky wedges. Christopher Bailey has created distinctly wearable looks, with flat shoes, backpacks and simple, structured coats, no doubt bringing new followers to Burberry, as well as keeping the traditional, pieces we know and love at the heart of the show.